The pre-shift equipment inspection is a key component to workplace safety and ensuring the equipment your business uses on a regular basis is up-to-date and fit for employees to operate. To make this daily process easier and more efficient for your workers, create a systemized pre-shift inspection form that guides operators through all the important steps. As the governing administration for safety in the workplace and helping to minimize work-related accidents, OSHA has a set of requirements that every employer must follow for forklift inspections before shifts. Specifically, OSHA requires that all forklifts must be inspected every day, before work can begin each shift. If forklifts are used every day throughout the day, they must be inspected after each shift. Additionally, OSHA recommends conducting a visual pre-shift inspection with the engine off, and then an operational examination with the engine on. Both of these inspections together will give the operator a good, reliable understanding of any repairs or adjustments that need to be made to make the forklift safe for use. Use the following information when inspecting your forklifts, and include the information specific to the type of forklift being used. Before a new shift can begin with a forklift, the trained operator must complete a visual check with the engine turned off. They must look for the following items before moving onto the engine running examination. The following should be inspected depending on the type of forklift being used. Once the pre-shift visual inspection is complete with the engine off, operators should perform a second examination with the engine running, to check for the following. 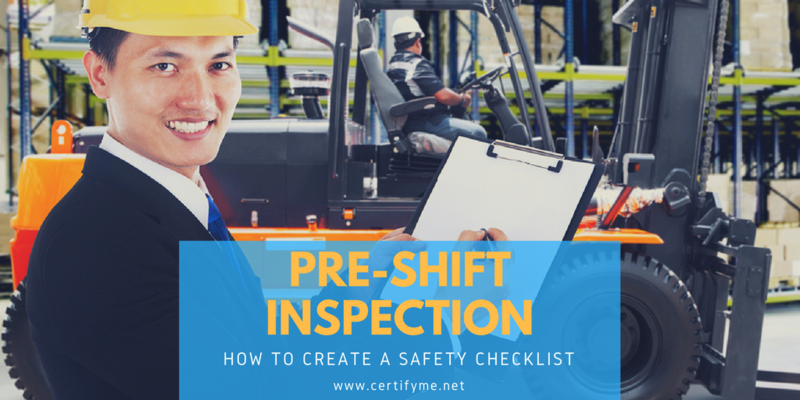 For a complete checklist that includes both the pre-shift engine off and operational engine on inspections, print and use OSHA’s document in your workplace. According to OSHA, only trained and evaluated operators can perform these inspections, and only trained operators can drive forklifts. To train and certify your operators with OSHA-compliant forklift certification, go to CertifyMe.net.